"We'll never win this war unless we are prepared to take risks. Sometimes great risks." 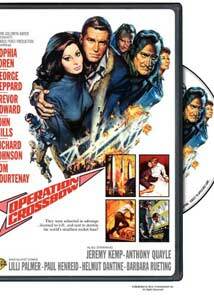 Operation Crossbow�a 1965 espionage/war thriller from director Michael Anderson (Around The World In 80 Days, Logan's Run)�has one of those "based on facts" plots that seems to hold pretty close to the truth. During World War II, the Nazis were developing new V-1 and V-2 rocket technology that could eventually rain long range death and destruction all over Europe, and unless it was curtailed by the Allies the war was about to take a drastic and deadly shift. That's the high stakes premise here, offering up George Peppard, Tom Courtenay and Jeremy Kemp as a multi-national mix of Allied spies dropped behind enemy lines to infiltrate the underground Nazi rocket factory at Peenem�nde, assuming the identities of three dead Dutch engineers. As they're parachuting their way in, the plan hits a potential snag, and with the Nazis suspicious of everyone the mission becomes even more dangerous. To further complicate the situation, Sophia Loren shows up as the estranged wife of one of the dead Dutchmen, only to be understandably surprised to find George Peppard now pretending to be her former husband. What's historically interesting about Anderson's film is that instead of being just another run-of-the-mill genre thriller, the story includes plenty of real-life elements like Peenem�nde�aside from the obligatory Winston Churchill character, who bookends the feature�including less famous types like British War Cabinet Minister Duncan Sandys (Richard Johnson) or German pioneer aviatrix Hannah Reitsch (Barbara Rueting), the world's first female test pilot. One of Reitsch claims to fame was having test piloted a prototype of the V-1 "buzz bomb", and that bit of history gets put on display here in a tense sequence as we see the Nazis getting closer and closer to perfecting their new weapon. Despite a number of recognizable faces in the large cast (Lilli Palmer, Trevor Howard, John Mills, Paul Henreid) there isn't really one person who dominates the narrative, though Peppard and Kemp eventually do become the cornerstone. The story moves around back and forth from Allied to Axis perspectives, with an added level of realism laid out by having the Nazis officers and scientists all speak in English-subtitled German. And unlike many war titles, Operation Crossbow isn't afraid about offing key characters, something that also enhances the whole potential danger element quite dramatically. While some of the effects shots show their age a bit, there's an underlying layer of suspense and tension in the plot throughout that almost supercedes some of the weaker visual moments. Maybe not 100% historically accurate on all points, but as a mix of WWII fact and Hollywood fiction Operation Crossbow tells a great story set during a dangerous time. Image Transfer Review: Presented in a not quite 2.35:1 anamorphic widescreen (it seems closer to 2:20:1), Operation Crossbow suffers from a few moments of specking and the occasional block of fine grain (most noticeable during the stock footage moments), but otherwise a fine transfer that carries a strong blend of color and detail, especially given its age. Fleshtones appear warm and natural throughout, and black levels look deep and solid. Audio Transfer Review: Warner Bros. has dressed up this release with a remastered Dolby Digital 5.1 surround mix, something that's a wee bit unnecessary, but a nice effort nonetheless. It's largely spread across the front three channels, with the most telling element being the solid treatment of the Ron Goodwin score, which comes across with a pleasing sense of depth. Voice quality tends to be a little on the thin side, but there's no evidence of hiss or crackle. A French language 2.0 dub is also included. Extras Review: In addition to a theatrical trailer, we're also given what's referred to as a "vintage" featurette entitled A Look Back at Crossbow (09m:49s). It's a 1965 black-and-white short that talks about the history of the actual Operation Crossbow, using a mix of archival war footage and clips from the film. What's initially a little odd is that the scenes from the film are in shown in black and white, making the separation between reality and fiction a little fuzzy. Here's a ripping good true-to-life espionage/war yarn that has held up exceptionally well since its release in 1965. Grim, inspiring, and full of historical "what if" scenarios, all buttressed by a nice transfer from Warner Bros.
An oldie but a seldom seen goodie. Recommended.